It’s a rough road out there. Exploring, or adventure riding, can lead down some unknown roads. Sometimes, this is my favorite kind of riding. Exploring new paths, finding great hideaways, and getting well off the main road can turn into an adventure of a life-time. Don’t get me wrong. Riding the long way to my favorite hideaway destination can be just as satisfying. Sometimes, just a slight change in the scenery can cure the must-ride-now itch. I’ve heard this saying a number of times when traveling. Some bikers like to count fill-ups, some like to count miles. When you really get serious, I guess you graduate to counting states or countries. (Maybe some day) For now, I like to tally up good times. Wether its iding down a winding road, or riding across the Mitt (Michigan), as long as we have a good time, it’s a good ride. A good ride and a smooooooth ride. One thing that I have discovered after pulling several motorcycle trailers is the effect of the tire size. 12” tires take pavement irregularities and potholes much better than 8” tires do. The larger radius tire can “ride over” larger pavement gaps and holes. Ideally, I scan ahead for those monster-back-breaking-holes. But sometimes they just cannot be avoided. 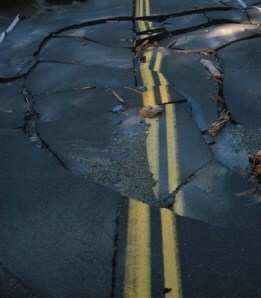 I would rather hit that pothole head-on than accidently push someone riding alongside me into traffic or off the road. Because pulling a trailer occupies more of the road, there are more hazards to look out for. However, the benefits can far outweigh the cons. I love pulling a trailer behind my motorcycle when it is time to take that long trip. Set-up properly, a good 12” tire combined with an independent adjustable torsion axle is my ideal, smoothest-pulling choice. An Adjustable Torsion Axle will allow for the desired center of gravity that you need. Lowering the center of gravity can help with wind resistance, cornering, and some extra storage room. The added space and ease of packing has also had an immeasurable effect on the way my wife and I plan for the road. If we want to bring it, we (she) brings it. Tire Check without a pressure gauge? Easy. Slowly run over some water. Your “wet” tire tracks should dry up evenly across the width of the tire. If they don’t, your tire is not contacting the pavement evenly. Picture yourself on a long, narrow, winding road way out in the country. The wind is crisp, the sun is just starting to fade, and a long days ride is coming to a end. You are completely relaxed from a great weekend of riding and sleeping in. Then it happens. A flat tire. Having a flat tire, with no plan but to stick your thumb out and hope for the best. Replacing a tire on the road should be considered before pulling out of the driveway. What if you never had to replace a flat tire? That’s the innovation behind airless tires. You bet I am looking into getting a set for my next trailer project. More to come on that later. Bring a spare and the means to change it. If space is an issue, it always is, bring a new can of fix-a-flat. Don’t count on it for a permanent fix, but it might help limp along a slow or small leak till the next town. Lights. Keep them on and be seen. Spare tire, or instant fix-a-flat. ← Wiring Basics and keeping the lights ON.